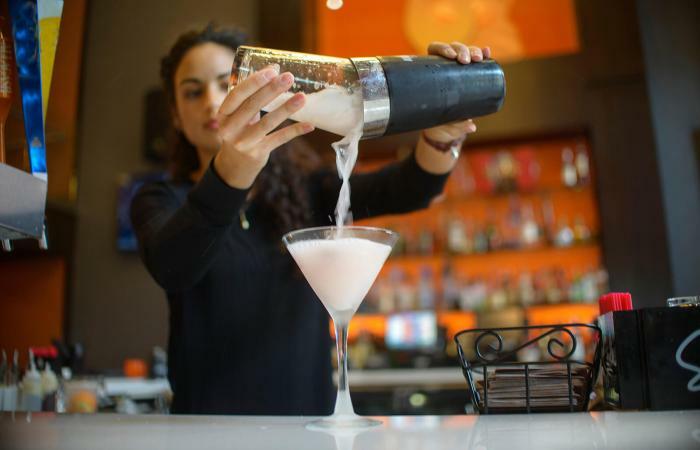 Every bartender needs to know how to prepare a variety of drinks in order to run a bar successfully. There are a number of basic cocktails that customers commonly order. Learn how to make these drinks, and you'll be well on your way to being prepared to work as a bartender! 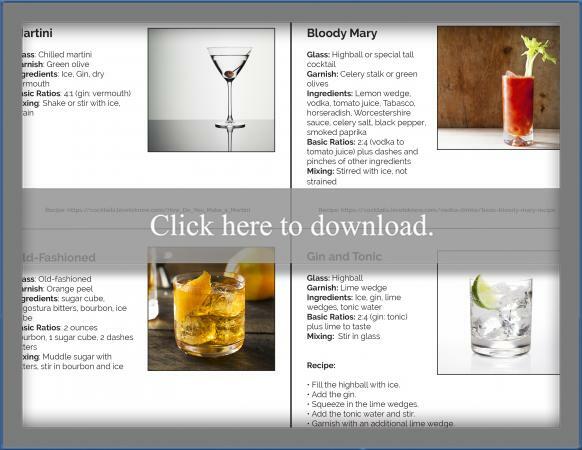 Recipes for a dozen of the most basic drinks you'll need to know as you start bartending are available in the printable below, which functions as a cheat sheet. It includes recipes, ratios, classic garnishes, and even what glass to use. Print it and keep it with you as you study and practice. To view and print, click the image. If you need help, consult this guide for printables. A classic martini is a thing of beauty. Dry, chilled, and aromatic, it uses just two ingredients, gin and vermouth (plus ice and garnish). Once you've mastered the classic version, you can try simple variations, such as a vodka martini or a dirty martini. The Bloody Mary is having a moment right now with popular versions containing an array of food garnishes, using bacon flavored liquors, or featuring lots of spice. However, before you can fly, you need to learn to walk, so it's important to learn how to make a classic Bloody Mary with tomato juice, vodka, and some spice. Once you've mastered that, you can start to embellish as your creativity takes over. Made with sugar, angostura bitters, and whiskey (usually bourbon or rye), a good old-fashioned never goes out of style. It's a supremely balanced drink with deep and complex flavors. Once you have the classic mastered, you can start to experiment with some fantastic new ingredients, such as a maple bourbon or flavored bitters such as orange, chocolate, or cardamom, to create new, exciting flavor profiles. Simple, refreshing, and lightly bitter, a classic gin and tonic combines two ounces of aromatic dry gin with four ounces of tonic water and a squeeze of lime juice. It's a great, fizzy summer cocktail, and you can easily vary it with a squeeze of another citrus juice (grapefruit is tasty) or by experimenting with gins that have different aromatic profiles. The classic kamikaze is a cold, sweet-tart combination of vodka, lime juice, and triple sec that's perfect for sipping. Learn the basic recipe, then try to fancy it up a bit, for example with fresh blackberries. Lemon drops are the Johnny-come-lately of martinis, but they're quite popular. With a sweet, tart, lemony flavor, this chilled and shaken cocktail is reminiscent of the candy after which it's named. Want to fancy it up? Drop an actual lemon drop candy in as a garnish, or add some fresh berries. This isn't your grandma's sweet tea. Long Island Iced Tea has been around for a while because it packs such a powerful boozy wallop with five different types of liquor including gin, vodka, rum, tequila, and triple sec or Cointreau. A Tom Collins is another classic cocktail that remains popular, particularly in summer months when people are looking for a refreshing drink. Made with gin, lemon juice, simple syrup, and soda water, it's aromatic, fizzy, sweet, and lemony. Learn the classic, and then add one more drink to your repertoire to create a less aromatic vodka Collins, which is a Tom Collins made with vodka in place of the gin. A Manhattan is a classic martini's darker, sweeter, slightly more complex cousin. Made with rye, sweet vermouth, and bitters, it's been a popular classic for decades. Sometimes the only cocktail that will suffice is a tart margarita. The classic version is made with lime juice, triple sec or Cointreau, and tequila on the rocks in a salt-rimmed glass. Master the classic before you expand to blended margaritas or fruit flavored versions like a strawberry margarita. Like the margarita, a classic daiquiri is a drink that is served on the rocks, although it is also popular blended and frozen. This sweet, tart, and refreshing cocktail contains lime juice, rum, and simple syrup. Master the classic, and then expand into frozen and fruity versions, such as strawberry or banana. A classic gimlet is made with gin, lime juice, and simple syrup. It's tart and sweet with plenty of pucker power. Once you've mastered the gin gimlet, you can easily vary it by replacing the gin with vodka to make a vodka gimlet. Every bartender needs to know how to make a nice selection of classic cocktails. From there, he or she can expand in repertoire to include creative variations on the basics before moving on to less commonly ordered drinks in order to offer skilled bar service.